The 3rd annual North Eats Food Festival, hosted by Baker & Olive, is primed to be the ultimate North County tasting event, taking place on Sunday, June 26, from 4-7 pm at Cape Rey Hilton Resort in Carlsbad. 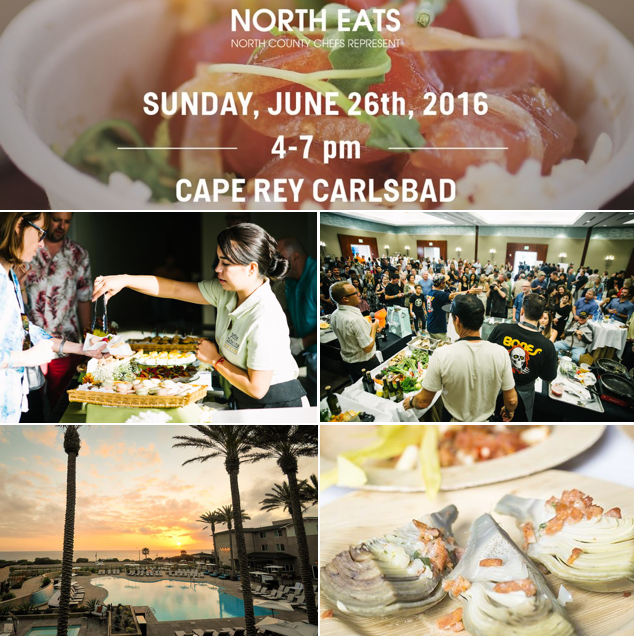 San Diegans will have the opportunity to experience the North County food scene from over 30 participating chefs, restaurants and food brands based north of the 56-freeway. We are offering promo code SDVILLE for $20 savings per ticket and also raffling off a pair of passes to attend. Participating eateries serving samples at North Eats include Solterra, Rimel's, Blue Ribbon Pizza, Craftsman New American Tavern, Wrench & Rodent, Panca Peruvian, Petite Madeline Bakery, Bull Taco, Cardiff Seaside Market, PrepKitchen, Pillbox Tavern, Hello Betty Fish House, Barrel Republic and more. Center stage at this festival will be a live cooking competition featuring 94.9 DJs Cantore & Woods and live music by local North County group Barnwell Shift. The event is open to all ages, tickets are $65 and can be purchased online. Promo code SDVILLE saves $20 per ticket, and $5 of every ticket purchased will be donated to Feeding America San Diego, the county's leading hunger-relief organization. For more information and to purchase tickets, visit bakerolive.ticketspice.com/north-eats-2016, and check out the video below for scenes from last year's event.